Well I bought a Sweet Sixteen, found one on Gumtree hardly used, full warrantee, all the extras, delivered by a delightful lady who even helped me set it up and showed me how to use it, what more could I want? 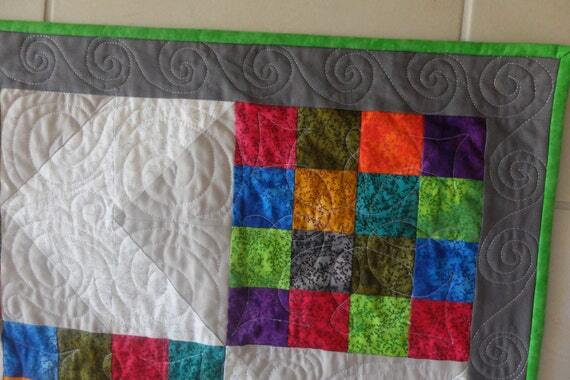 So I played with it for a while to get the tension right and then quilted my first quilt on it. Still lots of improvement to go but I was quite happy with the result. Etsy Australia are running a wonderful campaign in partnership with Plan International to change the world for girls. Plan International’s Because I Am A Girl campaign is aiming to break down barriers and change the world for girls. They believe that if they can help break down the barriers that prevent millions of girls around the world from gaining the education and skills they need to move from poverty to opportunity, that girls really will be able to transform the world for the better. Etsy’s community of Australian sellers care about girls’ rights and have decided to get together to support Plan’s Because I Am A Girl campaign in their work to change the world for girls. I have decided to join in this worthwhile campaign ... watch this space for more information! A new machine in my future! I went to the Newcastle Craft and Quilt Show a couple of weeks ago and had a great time playing on a Handi Quilter Sweet Sixteen.... I'm in love! It was so much easier seeing where you were quilting, great lighting huge throat, a delight to free motion quilt on. I've not been able to get it out of my mind, I want one! It took 2 weeks to quilt the Owl quilt due to only being able to quilt for about half an hour without needing a break.. stiff neck, sore shoulders, I'm sure quilters out there can empathise! And it's mostly because of the position of the machine and having to peer around to see where you are going next and the wieght of the quilt. I spent an hour quilting non stop at the show and had no aches and pains and saw everything clearly, so I went looking for one at the cheapest price I could find and low and behold on Gumtree of all places I found one that is hardly used, still under warranty and with all the extras including the stitch regulator, extra needles etc, and the price? Less than the cheapest basic new model. Needless to say I am buying it! Just waiting to work out how to get it from Sydney to my place, but where there's a will there's a way! Watch this space for the next installment! The Owl quilt is finished and on it's way to my niece in the UK, I hope her daughter loves it! My niece in the UK fell in love with my Butterfly quilt and has asked me to make the same quilt but with Owls on for her gorgeous daughter, my great niece. 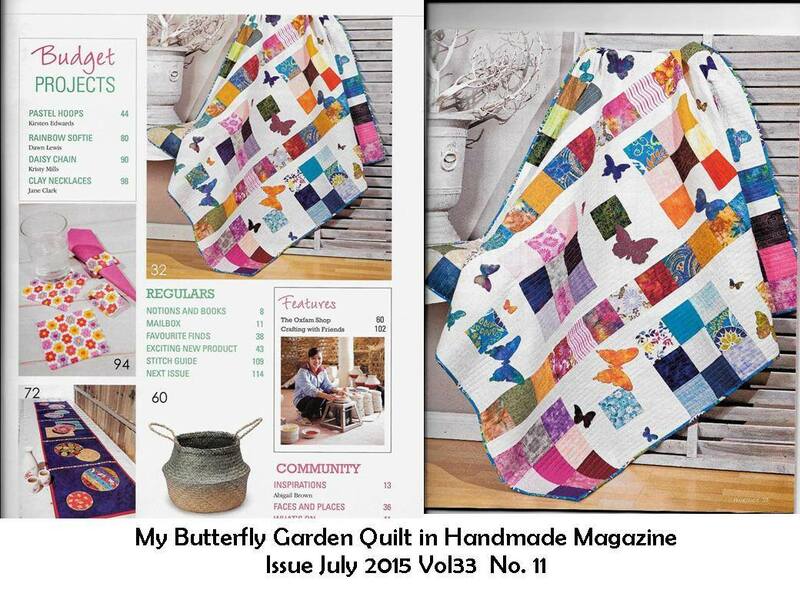 Well it's really rather hard to scatter owls all over a quilt like I did the butterflies when you consider there are about 8 pieces for an owl, only one for the butterfly! So I decided to remove the square within the square and instead applique a different owl on each white block. 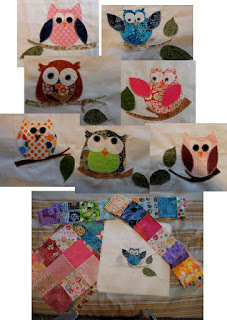 Here are the owls all done, and the blocks and strips ready to go. I have since finished the top but need to quilt it yet, I'll pop a photo on again when it's all done. I love these owls, so cute and all have their own character. When I have finished that I have already started to work on a new scrappy quilt ... this is the design, a great way to use up all those 2.5 inch strips I have left over from other projects! It won't be this colourway, this was just to use as a guide, I can't wait to start! It's also available for sale in my Etsy shop .. I won't be making another one so if you want it you had better be quick! Christmas in July, the UFO Finale and a Win! There's a lot going on in Etsy for the Christmas in July promotion. One team I belong to has a board of some fabulous Christmas ideas for gifts, table decorations, quilts and all sorts of Christmas goodies in the one place. Well worth a look! 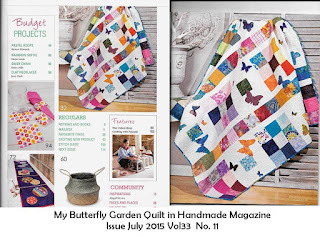 Also on the Etsy front the Quilts Quilts Quilts team have just finished their UFO contest... it was started on this blog way back in January 2015. Voting is has now started! 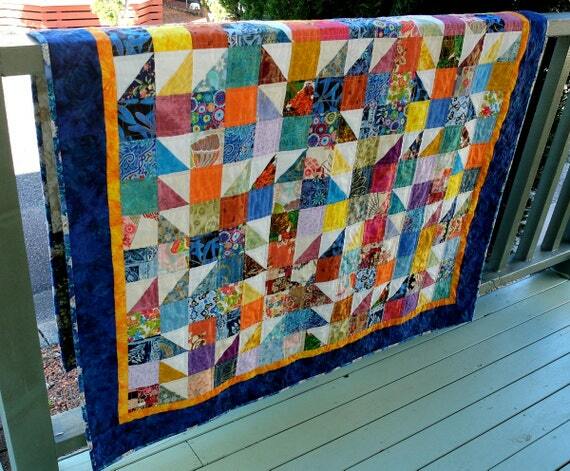 I ended up doing shadow straight line quilting around each small square and a loopy swirl on the blue border. I used a pounce pad and a stencil for the border quilting. Now to have fun going through my stash and working out what to do next. 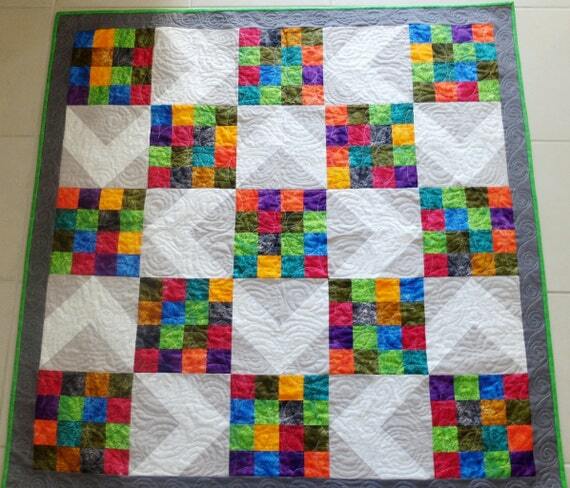 I have 2 baby quilts on order, a chevron one in grey, aqua, yellow and white and a unisex baby quilt. 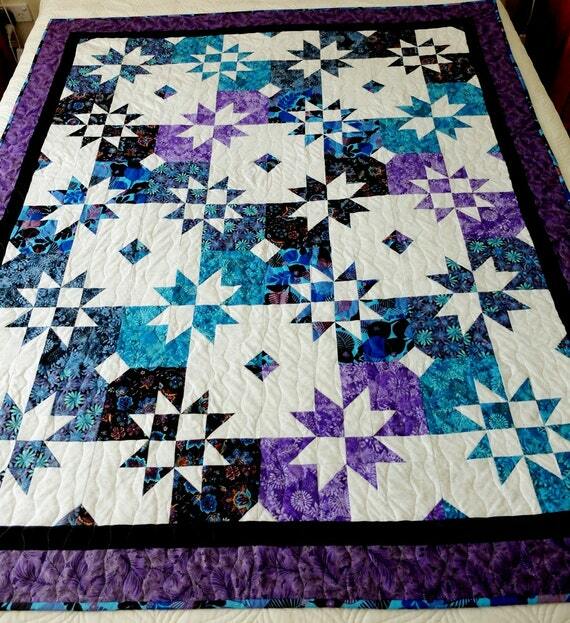 And here is the quilt top from the EQ7 design I did last week, scroll down to the last blog to see it. I had to make some more HSTs using up other scraps, but apart from the border every piece is from my scrap collection. I think it came out pretty true to the design, I'm very happy with it. Now I just have to decide on how I am going to quilt it, any suggestions? Scrappy Quilts Galore in my future! I have spent the last couple of days sorting through a huge box of scraps of every colour and size and trying to get them into some sort of order so I can actually use them. When you pay over $20 a metre in most quilt shops in Australia for good quality cotton quilting fabric your scrap basket becomes a rather expensive waste! So with new blade in my rotary cutter, cutting mat, rulers, iron and starch spray (I've found Homebrand is the cheapest and best for getting out those stubborn creases) and various plastic containers for the different size pieces I set to work. 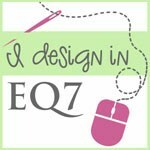 I tried out a couple of designs in EQ7 to see how I would use the most awkward sizes, especially as I found a pile of untrimmed HSTs (half square triangles) that were crying out to be used. and played with a block using the HSTs in the centre strip then rotating the blocks for a fun design. Using 3.5" squares I came up with this one. The block is made up of 6 x 3.5" squares with HSTs of the same size in the middle, then rotate alternate blocks. The border colour will change I'm sure depending on what fabrics I find in my stash at the end and the colours will certainly be very random throughout the quilt. I think I prefer it to the Twin Sister design, what do you think?